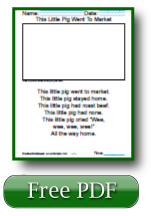 In our 1st grade reading comprehension worksheets below I have included many kids nursery rhymes, the Pledge of Allegiance, and the words to the Star Spangled Banner. There are two sheets per download for different reading levels. There is also a wonderful printable download of A Child's Garden of Verses by Robert Louis Stevenson below that has copywork of his poems, including a cursive version. Scores of Kindergarten and 1st grade reading comprehension worksheets for reading skills. 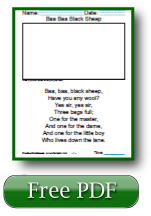 Pledge of Allegiance and Star Spangled Banner worksheets. There are no pictures, so the child thinks about what he heard or read. 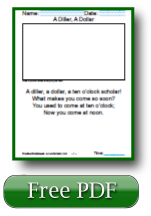 Buy These Reading Worksheets In One Bundle! "If I had to teach in a secular school, A Child's Garden of Verses would be my best friend! It's so good for children and is universally recognized as good literature. It's something you can use to teach morals without scandalizing. It teaches a wonderful perspective, too." 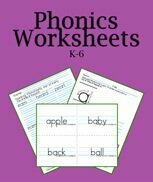 Use these 1st grade reading worksheets for several levels of practice from tracing letters and words, to phonics and reading comprehension. There are kids nursery rhymes and A Child's Garden of Verses by Robert Louis Stevenson. We offer these free or you can purchase the downloads in one bundle. Classic treasury of poems for children. Robert Louis Stevenson wrote some of the most beloved poems for children of all time. 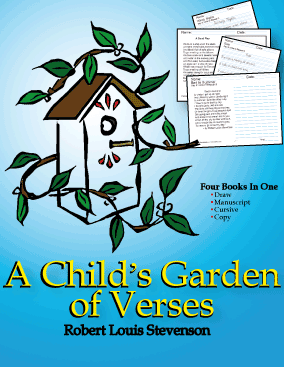 His A Child's Garden of Verses captures some of the sweetest elements of childhood. 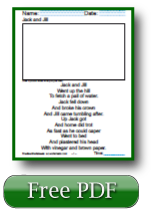 This printable Reading Worksheets download has his collection in several formats. Your younger students will enjoy hearing you read the story for them to draw what they imagined hearing. Older students can copy the poems on ruled lines or unruled lines. 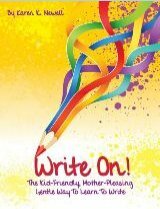 The whole set is included in a cursive writing format as well, so that you have great resources for handwriting practice worksheets. 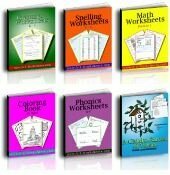 One of the most important features of good reading instruction is to find interesting reading material at a level that your readers can enjoy or appreciate which is why I've made this giant bundle of reading worksheets that have different variations on the worksheets theme. 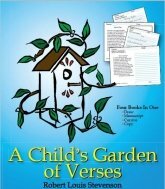 A Child's Garden of Verses﻿ is a wonderful start for teaching your students reading, poetry, and beautiful handwriting. 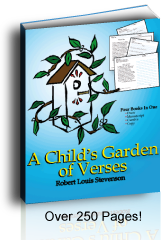 A Child's Garden of Verses written by Robert Louis Stevenson is a beautiful collection of children's poems. I think that part of the magic is that he wrote many of them when he was still just a boy! Level One: has the poem written out with a place for the student to draw a picture. See these at the bottom of this page. Level Two: has the poem written out on lined paper in manuscript with a blank line for the child to copy. Level Three: is similar to Level Two but in beautiful cursive writing. Level Four: has the poem written on one side and plain lines to copy the poem on the other side. 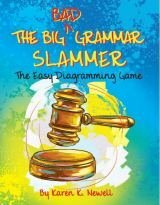 In the past I had posted whole word reading flash cards here because they can be really great for reading practice, yet I really believe that teaching phonics, the individual sounds of the letters and their combinations, is the keystone to future reading comprehension success for beginners or for rescuing an older student that has had difficulty. Even slower students who know the phonics sounds and the phonics rules begin to advance quickly once reading clicks in their minds. Phonics makes the click. Once any student has the basic reading comprehension skills he is free to read, and thereby, to learn almost anything! Once he can read the phonics sounds and can divide words into syllables he can read longer words without needing to be taught the new words that he can read. Faster children benefit quickly and slower children have fewer difficulties. Once children begin to understand the prefixes and suffixes added to base words they can understand perhaps a dozen words by learning one new word. Learning the phonics rules helps them here, too, especially for being able to write. Most students still need phonics lessons and review throughout the elementary education years so as to practice the phonics rules for bigger words with prefixes and suffixes. The prefixes and suffixes are what expand reading comprehension at any age. Then? Practice makes perfect! Read and write. 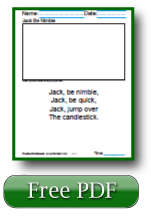 I read an article lately that convinced me to remove these flash cards, "Whatever Happened to Phonics", by Bruce Deitrick Price. He mentioned Rudolf Flesch's book, Why Johnny Can't Read, that shows that phonics is the easiest way for children to learn to ready well. Personally I find that one of the best reading activities is, of course, to read. 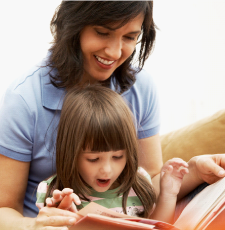 This involves more effort on the part of the teacher or the parent in the beginning to make sure that the child understands what he is reading, but it is so worth any extra effort for the future. Teach your students write the material, or copy it. This ensures that your student has reviewed it, especially if you coach them to say it while they write it. Most children will then be able to read the selection better. Let them practice it till it's easier. I find with the children that I have taught that if a child reviews a passage several times in several ways he can more easily comprehend its meaning. It's called studying. It takes this sort of work for any of us who are learning something new. For older students reading comprehension can be improved by reading a good selection alone in a quiet place and reading only difficult phrases out loud as needed for comprehension. I believe that once a student has worked through several complicated books well, that he is able then to read anything after that. The effort to get there is well worth it. Early Americans learned to read with not much more than a Bible in the home. Think. Once a child can read the Bible, he can read anything! 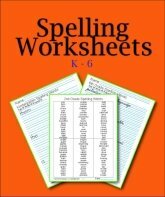 It is one thing to hand a child a worksheet that amounts to a quiz, yet it is an entirely different thing to hand him our practice reading worksheets that have the correct spelling to copy. Copy work is a reading activity by which a student can actively improve his skills by his own efforts. Even handwriting practice helps reading comprehension since the student must pay attention to every character in the words he is reading and must work in the direction that we read. Reading and writing the English language happens left to right. Writing reinforces this truth and habit for reading. Copy work can be very helpful. In the old days Laura Ingalls Wilder copied from a book to a slate and even today college students take notes all day long to remember their work better. Writing does aid reading and memory. After a student can read at a third or fourth grade level the main difference in books between the elementary grades is the length of the book and maturity of content. Elementary reading books have shorter stories, more pictures, and use the plain meaning of words. High school books are longer, have fewer pictures, and cover more complicated material. Choose books that meet your students' reading ability and general ability to sit through a long study, but do not chose books with limited vocabulary - at least for very long. 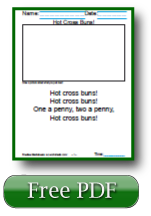 Our 1st grade reading comprehension worksheets are handmade for real children. I've used these reading worksheets with my own children and I hope that my own grandchildren will also learn the material they teach! Sound Beginnings by Julia Fogassy. 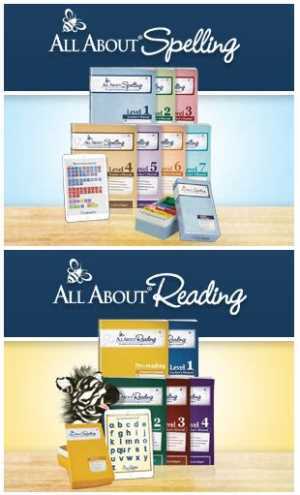 These have reading lesson plans that aim at teaching the Orton phonics sounds and the phonics rules taught by Dr. Orton. These companies all have a flavor of teaching phonics explicitly, not making the child guess or hope to take a photographic memory of a zillion words as pointed out by Rudolf Flesch in his work! If you're looking for a tutor or reading coach, I'd like to recommend a dear lady who loves to help students! She's so bright and inviting that everything she does is fun! Rene is a Learning Disabilities Reading Tutor who offers a site that is not just for parents teaching their LD child, but for ANYONE who has a child struggling with reading and will benefit from a 20+ year reading specialist. She uses the Orton based phonics methods. What is so rare is that she offers LIVE one-on-one Virtual Tutoring also and really teaches the basics like phonics as she starts if your student has not mastered that aspect of reading. See Rene's heartwarming reading success stories especially if you're from the Topeka, Kansas area as she is an excellent tutor.